Robert Sclater, who has lived and worked locally all his life, has submitted ‘Remember Dunfermline’ to the Scottish Book Trust’s My Favourite Place project. The former pupil of Blacklaw, Woodmill and Queen Anne Schools did so on the recommendation of a tutor, after attending a creative writing course held in Carnegie Library and in East Port’s Music Institute. 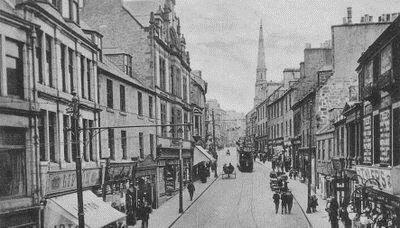 If accepted, ‘Remember Dunfermline’ could be published in a book or broadcast on BBC Radio Scotland. Though he is now retired, Mr Sclater’s long career has included redesigning the visitor maps in Pittencrieff Park and working for the well-known architects James Shearer and Annand, where he began his apprenticeship alongside Pete Agnew of Nazareth. For a bag of sugar or a packet of tea? With Rampant Lion and Union Jack. Just to gain access to the upstairs bar?